Sailing is tough. The tasks of trimming sails, steering, shifting weight and tweaking sail controls to maximize boat speed is a great challenge unto itself – and once you feel at least mildly competent with boathandling, you need to get your head out of the boat and learn tactics and strategy. To add to the confusion, the race committee can sometimes catch you off guard with flags and signals that seem to come out of nowhere. But, believe it or not, a great way to learn more about sailboat racing is to actually step out of your sailboat and join the race committee team. Beyond providing great opportunities to learn through observation, putting some time in on the race committee boat is also an opportunity to learn that rules that apply to the race committee’s actions and to give back to a sport that is self-policing and is run by volunteers on all but the highest levels. Doing race committee can seem like giving up a day to help others, and it is. But if you’re smart about it, a day of race committee can also be a day to improve your own sailing skills. A day on race committee is not a day to relax and get a tan – you will undoubtedly be put to work. Depending on the size of the regatta and your role on the race committee, you may be moving marks, timing for starts, raising flags, scoring the racing, helping with safety, or all of the above. That said, almost any role on the race committee affords an opportunity to observe other sailors. If you’re on the starting line, look at how boats set up for the start. Are they on the line or well below it? If you’re at a mark, watch how the lead boats set up for the rounding. How does their approach differ from those at the back of the pack? If you can determine why some boats look better than others, you can apply those lessons to your own racing. Don’t be shy about asking your fellow race committee members about what they see. Race committee is also a great chance to meet other sailors and learn from their experience. You can also snap a few pictures or jot down a few notes to refer back to later, or to ask competitors about after racing. Of course, be sure not to let your observations get in the way of your race committee obligations and be sure not to interfere in any way with the racing. If you’ve looked carefully at the Racing Rules of Sailing, you probably know that Part II addresses issues that arise when boats meet. Most post-race discussions, whether friendly or heated, are over rules in that section of the book. Yet Part II is only a piece of the pie. The flags depicted in the inside cover are more than just a colorful welcome to the book and Part III isn’t just there to keep Part II company. Flags and visual signals are one of the race committee’s primary methods to communicate with competitors, and Part III describes standard procedures for the race committee to run racing. You can learn these rules by staring at the rule book or by making flash cards, but once you’ve raised flag C and blown repetitive sounds, you won’t forget what C looks like or that it means change of course. Chances are, you will also become more aware of why and when a committee will (or will not) change the course. While sailing your race and focusing on everything that’s going on in your boat and the boats around you, you may not be aware of a shift, but the race committee is constantly monitoring the wind to ensure a square course. Adjusting for a windshift involves some timely work for the race committee, and after being involved with that process once or twice, you’ll have a better sense as a competitor as to when and why a race committee might change or shorten course. In addition to Race Signals and Part III rules, your time on race committee might help you find Appendix A, which explains scoring, another area that seems to completely baffle some sailors. Finally, serving on the race committee is a way to give back to the sport. Most races are run by volunteers, so if you have ever enjoyed a day on the water racing, it’s a nice idea to pass that along to other competitors. Serving on race committee can be hot, cold, lonely, or tedious at times, but running good races can also be incredibly informative for your own sailing skills. Chances are that next time you take your boat out to the course, you’ll have a better understanding of what the race committee is trying to do or say and why, which can only be helpful for your own sailing. And once you become an experienced contributor to the race committee, you can move into hearing protests, and enrich your understanding of the rules by doing so. 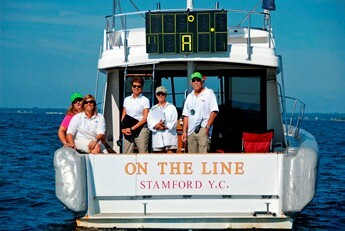 Clemmie Everett the Assistant Sailing Coach at Rye Country Day School in Rye, NY. Get out on the RC Boat! Many clubs need young people to step up and help with RC. While spending time with one’s family is certainly important, time can be made to give back to the sport. RCs work very hard and sometimes take abuse. (No, the Mooseheads* are not a form of abuse.) Anyone who sails should go out of his or her way to thank the RC. Even better, join them. Bill – Indeed, some of the best sailing lessons can be learned while working RC Duty. Absorbing the vast knowledge of seasoned race officers, learning to set a proper course, watching good (and bad) starts and learning about one’s competitors’ habits are all invaluable – and can be garnered while giving a little back to the sport.